Two nights aren’t enough to experience everything Silverado Resort and Spa has to offer. With our Third Night is On Us package, you’ll have ample time to sample exquisite food and wine, refreshing spa treatments, world-class tennis, and our two PGA-caliber golf courses. All packages are subject to availability. Resort credit does not apply to Rate. Does not include per night taxes, gratuities, or resort fee. All recreational amenities, including golf, are weather permitting, with no rain checks. Not applicable to group or wedding attendees. Cannot be combined with any other offer or discount. Non-retroactive rate — prices subject to change without notice. Unused package components will not be refunded. Cancellation Policy: 72 hours prior to arrival to avoid a charge of one night's room, tax, and resort fee. Book your stay early, pay in advance, and enjoy a special advance purchase rate. Save up to 25% and receive extra Wyndham Rewards points, in addition to the points you’re already earning from your stay. A non-refundable deposit of 100% of entire stay (plus tax) is due at time of reservation. Reservation cannot be canceled or changed. No refunds or credits will be allowed. Some restrictions/blackout dates may apply. Silverado Resort and Spa is a proud participant of the Wyndham Rewards Program. Stay at all Wyndham Hotel Group properties around the globe, and redeem points at our upscale Napa resort to cash-in on value. The Wyndham Rewards Program is free to join. Not a member? Join today and earn points that you can redeem for future vacations. Your AAA membership can save you up to 30% off our Best Available Rates. Get the most out of your getaway with this limited deal — you must present your AAA card at time of check-in. All packages are subject to availability. Resort credit does not apply to Room Rate. Does not include per night taxes, gratuities, or resort fee. All recreational amenities, including golf, are weather permitting, with no rain checks. Not applicable to group or wedding attendees. Cannot be combined with any other offer or discount. Non-retroactive rate — prices subject to change without notice. Unused package components will not be refunded. Cancellation Policy: 72 hours prior to arrival to avoid a charge of one night's room, tax, and resort fee. Early Departure Policy: Guests who depart prior to the confirmed reservation end date will be charged the last night’s room, tax, and resort fee. Present your resident ID and save 12% on our Best Available Rate. 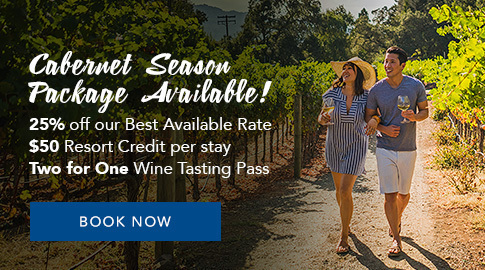 Embark on a wine country getaway and take advantage of special savings. Present your California resident ID and save 12% on our Best Available Rate. Additionally, feel free to enjoy a complimentary late check-out until 2 p.m. for Sunday departures. For all offers, rates vary depending on room type and location. Quoted rates are available for our tour and leisure guests only, and exclude tax and $25 nightly resort fee. For groups or meeting information and rates, please contact our Sales Department. Rates and availability are subject to change without notice. Blackout dates may apply. Room upgrades may be available at an additional cost. Prime season weekends may require two-night minimum stay. Cannot be combined with other offers or packages. Must present your California ID upon check-in. Cancellation Policy: 7 days prior to arrival to avoid a charge of one night's room, tax, and resort fee. Early Departure Policy: Guests who depart prior to the confirmed reservation end date will be charged the last night’s room, tax, and resort fee.